ClearStream captures visitors at the point of decision, which creates ENGAGEMENT. ClearStream is the clear choice for Guests and Stakeholders in the act of separating their discards. Pairing up ClearStream’s mobile, compact black trash and clear recycling containers helps visitors see exactly where to sort their discards. Bins are set up and serviced without special equipment. A full ClearStream bag can be seen from a distance and serviced immediately, preventing overflows. Bags slide out the front of the container without vertical lifting, reducing back injuries. A new bag attaches quickly to the patented baglock, which holds it in place. When the event is over, the folding frame and nesting lids are easy to transport and store. Volunteer groups can take charge of their own collection, saving the event a lot of staff labor costs. Rewarding volunteers with volunteer share programs helps them achieve their organizational goals. With a one-time investment, one set of the bins can also be shared between multiple community events, maximizing cost-effectiveness. Clear Visibility also reinforces the Department of Homeland Security's "See Something, Say Something" campaign. 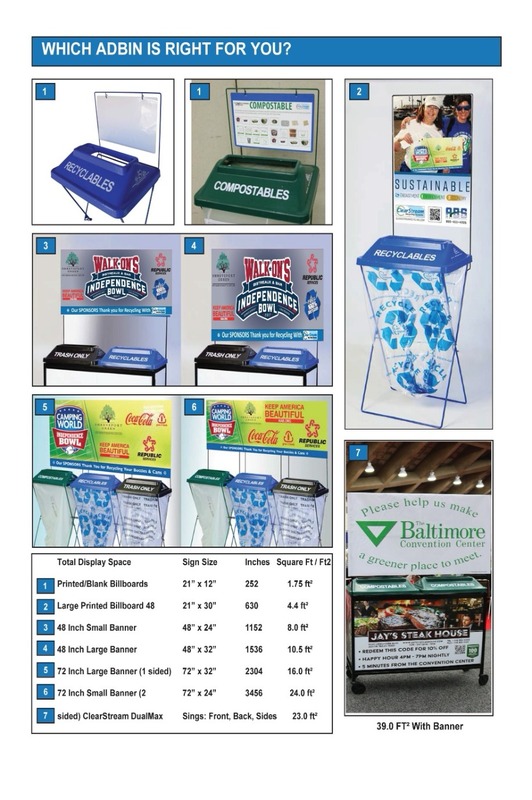 Venues provide advertisers new sign display opportunities on ad bin system collection containers which they sell to advertisers. These mobile ad displays are sold exclusively to one advertiser and placed directly in the line of sight of guests. Putting PRIMETIME signs in high-traffic locations provides advertisers their largest available PRIME time audience while generating revenue for the Venue. Which Ad Bin is Best for your Environment? This chart shows how the ad bin display system maximizes the total square feet (ft.²) of advertising opportunities for creating new revenue.